Can you withstand the power of the Guardians? Temple Raid is a new, massive PVP event where teams compete against each other to raid Temples on the mysterious elemental islands and defeat the powerful Guardians. Many elemental secrets await your team on the islands. 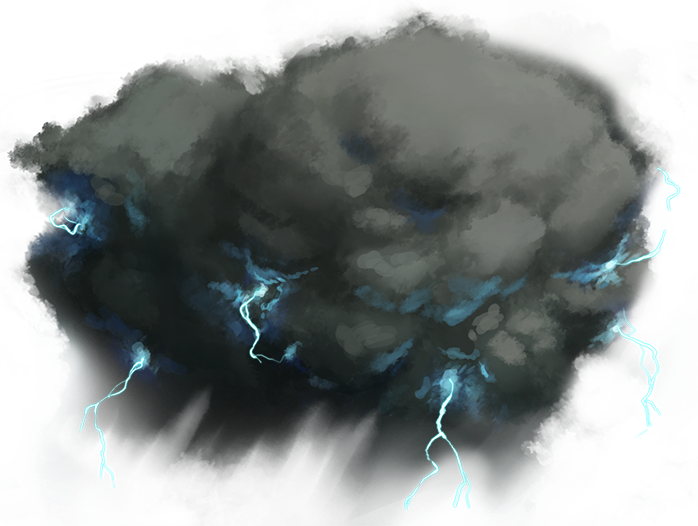 An ominous Storm makes its ways across the sky, supercharging any island it passes over. A shrouded land lays hidden from view, revealing itself only to those who have proved their mastery over the islands. For a live demo of the Temple Raid event, take a look at our Twitch stream from last week with Crisis and PGCoffee! Please Note: The Temple Raid event will be available for iOS players on iOS 9 or later only. It will not be available on iOS 8. There are five elemental islands in the Temple Raid event. Each island channels the power of the five elements: Dark, Ice, Fire, Earth, and Wind, and the islands are themed according to their respective element. Any player can choose any island to progress on, though it is wise to communicate with your fellow teammates to develop a strategy. The goal of Temple Raid is to battle across these five elemental islands, progress down the island path, and reach the Temple to defeat the powerful Guardians that lie in wait. Score as many Victory Points for your team as possible before the end of the event and defeat enemy teams to get major rewards! On each island, teams will encounter four Temple Guards and one main Temple. Temple Guards are smaller monuments stationed along the island path, and the main Temple is the large citadel-shaped building in the center of the island, at the end of the path. 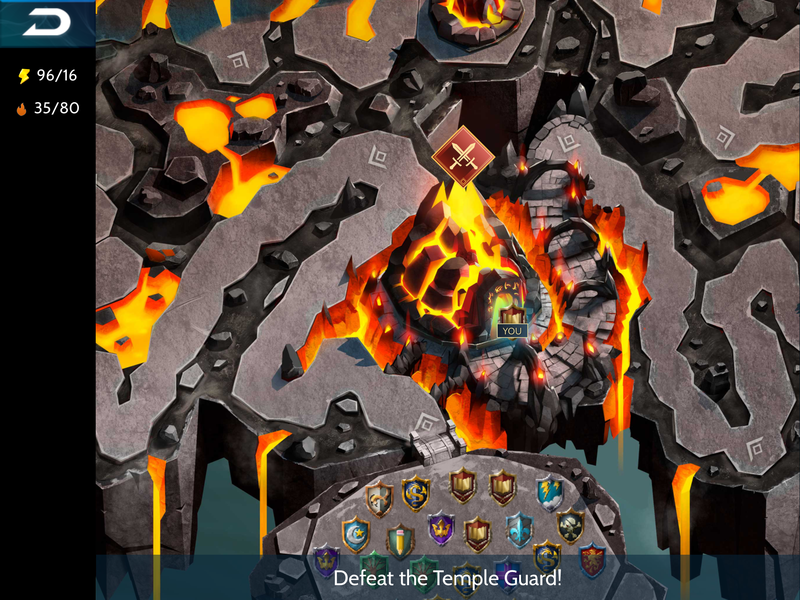 Teams must progress past all four Temple Guards to reach the Temple at the end. The fourth Temple Guard will be at the gates of the Temple, and it is the last stop on the island path to complete before entering the Temple itself. Teams can earn Victory Points (VP) in two ways: by defeating the Temple Guards on the island path, and by defeating the Guardians located inside the main Temple. The amount of points needed to reach the Temple Guards on an island will depend on League - a higher amount of points are needed to reach Temple Guards in higher leagues, which is a similar mechanic used in other PvP events, like Kingdom Wars. The amount of points needed will always remain consistent throughout the event. For example: It may take your team 6k progressional points to get from the starting position to the first Temple Guard, 6k point from the first Temple Guard to the second, and so on. Here’s where the PvP aspect comes into play: In order to progress down the island path, players must attack enemy teams to advance. Teams that you attack on the island path will lose progression on the path and be pushed backwards while your team advances forwards. Temple Guard Stations serve as a checkpoint for progress, so your team cannot be pushed back beyond this point. This is especially important to keep in mind when an island is supercharged by the Storm (more on that later down the post). Inner Fires can be used in any of the attacks made against teams on the Island Path and the Temple Guards. Inner Fires will not be available to use against Temple Guardians or Shrine Guardians. The points awarded for defeating other teams on the island path only count towards a player’s personal progression prizes, and will not provide any Victory Points for the team. Points earned when attacking other teams can never be detracted from your event score, even if your team has been pushed backwards on the path. All personal progression points and team Victory Points are cumulative, and can never be taken away. Defeating the 4th Temple Guard will automatically start the 2 hour timer for the Temple raid (see "The Temple" below). When your team defeats the final Guard at the gates of the Temple, the next thing your team will see is the Entrance screen, which must be tapped to proceed into the Temple. As soon as you begin attacking any of the four Temple Guards, you have “reached” the checkpoint portion of the Guard. Meaning, if your team is attacking a Temple Guard, you are already in a position where teams cannot push you backwards to a point before that same Guard. You do not have to fully defeat the Guard before the checkpoint is established. There is currently no indication for which player deals the final blow to the Temple Guard, and is the one to enter the Temple on behalf of the team. This is definitely reliant on team coordination to determine when the ideal time to defeat the Guard will be, so that as many people are online for the next two hours to attack the Temple Guardians! Your team can choose to wait at the 4th Temple Guard without fully depleting its HP as a strategic decision to gather the troops and attack all at once. It’s up to your team as to how you’d like to coordinate the entrance into the main Temple. Intrepid teams that reach the Temple at the end of the Island Path will face off against the fearsome Temple Guardians. Once inside the Temple, a team will have 2 hours to raid the Guardians. No other environmental factors can take your team out of the Temple, meaning your team will have the full two hours to attack the Guardians even if the Storm enters the island within this time, or if other teams on the island path attack your team while you are in the Temple. Inside the Temple is a fully PvE (Player vs. Environment) experience. This means that you’re on your own! Your teammates will be unable to follow you in your attacks against the Guardians, and likewise, you will not be able to follow them in theirs. It is up to your skills as a flyer and the persistence of your Dragons to defeat the Guardian bases. Each Guardian in the Temple represents a different Tier in-game, starting at Red and going through Harbinger Tier. All players, regardless of player level or in-game progression, must start at the Red Tier Guardian and successfully work their way up to the higher Tiered Guardians. In addition to this, only Dragons of the same Tier as the Guardian can be used to attack the Guardian’s base. This means that all players must use Red Tier Dragons to defeat the Red Tier Guardian, Purple Tier Dragons for the Purple Tier Guardian, and so on. Players can only attack Tiered Guardians if they possess Dragons of the same Tier. For those higher level players, it’s time to dust off some of your old favorites and prepare them for battle once again! The bases that are controlled by the Temple Guardians will be varied in skill and structure. 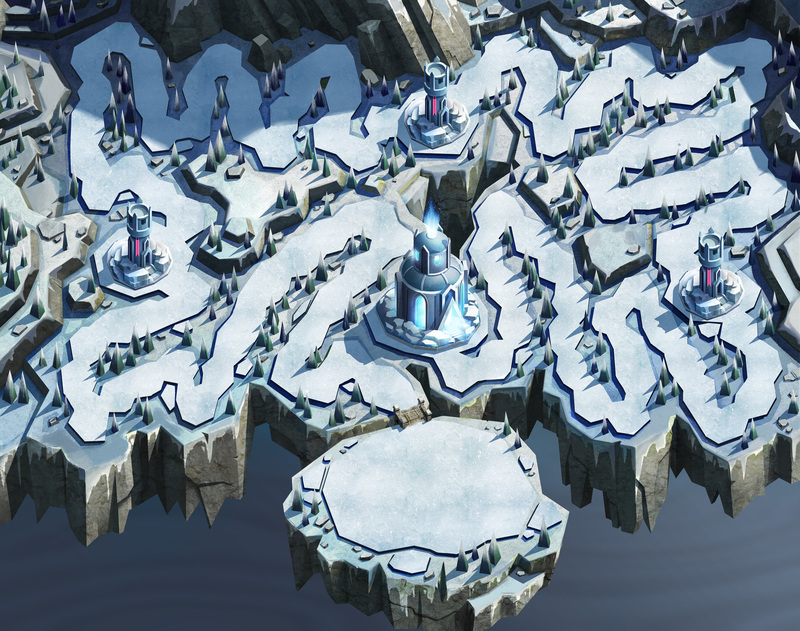 You may see multiple totems on one base island, or two of the same flak tower. The Guardians are unbeholden to the rules that Dragon Lords must abide by, so these bases may pose more of a challenge to Temple raiders. Dragons of the matching element to the island will be at an advantage against these bases. Keep a watchful eye on the elemental totems that these bases possess and think strategically about what Dragons to use against each base to make the most of the elements! Divine (Seasonal) Dragons can be used in any of the Temple attacks, but can only be used in the Tier that they are currently in. If players have evolved these Dragons, then whatever Tier they are currently evolved into is the Tier they can be used for when attacking a Temple Guardian. Each Guardian defeated will earn your team the amount of Victory Points listed under the Guardian’s tile in addition to personal progression prizes. You’ll need to meet standard victory conditions to succeed, which is destroying at least 70% of the base with no more than 3 Dragons. The first attempt at attacking any Temple Guardian will cost NO energy! Upon successfully meeting victory conditions against a Guardian base, the next Tier Guardian will unlock and a new attack (at no energy cost) can begin. If you fail your first attack against a Guardian, you will have an opportunity to attack their base again at the cost of 2 energy. Unsuccessful attempts will required 2 additional energy each time, eventually capping out at 8 energy required. This means the second attempt will cost 2 energy, third attempt will cost 4, fourth will cost 6, and fifth will cost 8. Continuous attempts after this will only cost a maximum of 8 energy to attempt. Once the 2 hours inside the Temple have expired, your team will return to the starting area of that elemental island. If the storm is present on the island by the time you exit the Temple, you will return to the main event screen. The event screen will visually show that your team has successfully reached the Temple of whatever elemental island you completed, and a part of the clouds to the Shrine of the Elements will be revealed. Your team can continue to attack an elemental island multiple times and defeat the Temple Guardians each time to earn more team VP! A Storm rages around these magical islands and will wreak havoc on each elemental island it hits. The Storm plays a significant strategic factor in Temple Raid, so it is wise to always know where the Storm is, and where the storm will hit next. The Storm will rotate around the elemental islands on a 3 hour cycle. It will spend 3 hours over an island, then three hours between islands, and continue its path across the map. The Storm will consistently revolve around the islands for the entire duration of the event. Tap on the Storm at any time to see how much time is left before the Storm rotates once again. All teams on the island will be pushed back to the main event screen. The island will be inaccessible to players while the Storm is there. The island will not be Supercharged until the storm leaves. The island it just left will now be Supercharged since the Storm has left. The island will have no team progression since it was recently cleared. The island is now accessible to teams once again. Supercharged: An island becomes Supercharged when the Storm left the island. 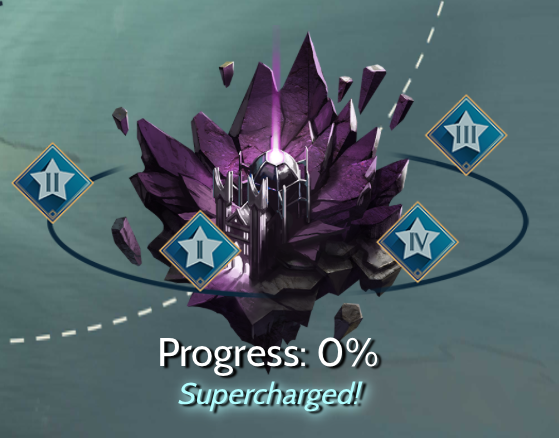 The Supercharged status is indicated by the blue “Supercharged” text underneath the island on the main event screen. A Supercharged island possesses a very important addition to the Temple Raid event. The Storm will leave currents of power in its wake, which will yield an increased amount of Victory Points to the first team that defeats the Temple Guardians. 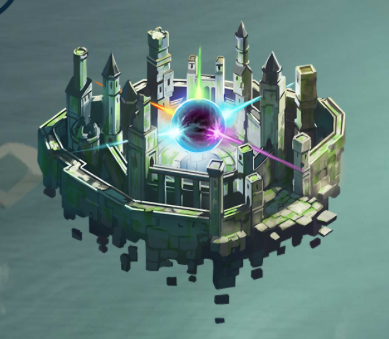 The Supercharge will only affect the main Temple on each island, and once the first team has reached it, the island will no longer be Supercharged. Knowing when an island is Supercharged is incredibly important to overall strategy and success in Temple Raid. 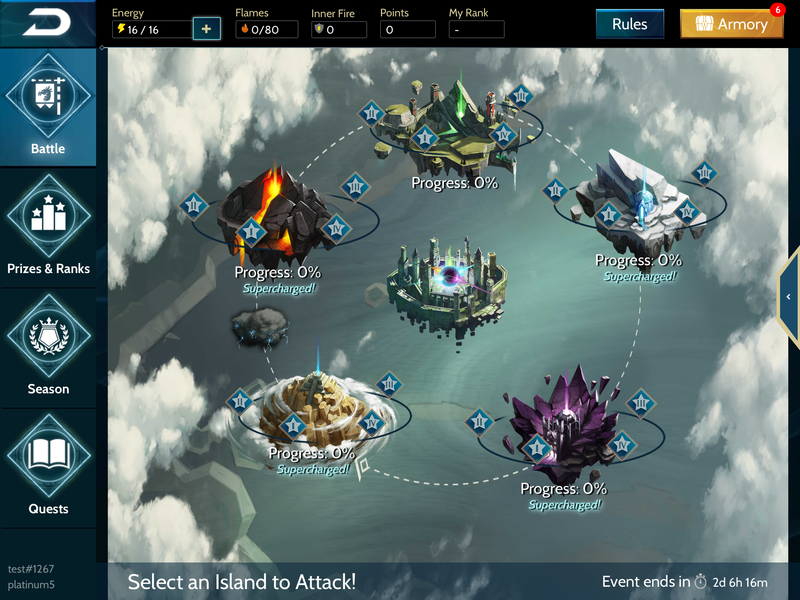 A newly Supercharged island will be an attractive endpoint for players, and many teams will want to battle to be the first to reach the island’s Temple. At times, it may be wise to complete the island path on other islands while the Supercharged island is fought over. However your team decides is the best course of action will lead you all to victory and success! The Temple Raid event will begin with all five elemental islands Supercharged, and the Storm will begin in between two of these islands. The Storm’s Supercharge will only grant boosted VP to the Temple Guardians, and not the island’s Guards, so gather your teammates for an all out assault and be the first to reach the Temple! After the many trials of the Temple Guardians, the clouds in the center of the islands begin to clear, one by one. At long last, the Shrine of the Elements reveals itself to your team, a symbol of great accomplishment having overcome the island’s challenges. But, the fight is not yet over. The final elemental Guardians have anticipated your arrival, and they are ready for battle. The Shrine of the Elements is an optional boss rush encounter of the Temple Raid event, which unlocks after defeating the main Temples on each island. Even after unlocking the Shrine, teams can choose to focus on conquering more Temples and earning more Victory Points in this way. There is no advantage to unlocking the Shrine of the Elements before another team. The Guardian bases in the Shrine will be heavy in power and extremely challenging to defeat. Are you up for the challenge? Once unlocked, the Shrine is permanently available to your team for the duration of the event. The Guardians within the Shrine consist of two Tiers: Orange and Harbinger. There is one Guardian of every element within these two Tiers, totaling 10 Guardians in the Shrine. Shrine Guardian bases will fall under the same battle rules as Temple Guardian bases. Players will be attacking these bases alone - teammates cannot follow or support. Likewise, only Dragons of the same Tier as the Guardians can be used in attacks. Players must meet victory conditions (70% or more of the base destroyed with no more than 3 Dragons) to succeed in their attacks and move on to the next Guardian. The first attack against any Shrine Guardian will cost no energy to attempt, and subsequent failures will increase the energy cost by 2, ultimately capping out at 8 energy. Seasonal Dragons can be used against Shrine Guardian bases so long as they are in the Orange or Harbinger Tier (depending on which Tier Guardian is being attacked). All players must defeat the Shrine Guardians in order, beginning with the 5 Orange Tier Guardians, and then moving on to the Harbinger Tier Guardians. Once all the Shrine Guardians of the Orange Tier have been defeated, players will receive a special Guardian portrait for one of the five elemental Guardians! This portrait is an individual prize, so only individual players who have accomplished this feat will receive the portrait. Likewise, those who defeat all 5 of the Harbinger Tier Guardians in the Shrine will receive an evolved version of the Guardian portrait, called the Uber Guardian. The particular elemental Guardian portrait provided as a prize for defeating these Shrine Guardians will rotate every time that Temple Raid occurs. For example: The first Temple Raid event will provide the Fire Guardian, Ignias’ portrait for those who defeat the Orange Tier Shrine Guardians, and the Uber Ignias portrait for those who defeat the Harbinger Tier Shrine Guardians. The next time Temple Raid occurs, the portraits will be of the Earth element Guardian, Sylvinias, and so on. Shrine Guardians can only be defeated one time during each Temple Raid event. To get more Victory Points for your team, players can continue to make their way down the island paths and attack the elemental Temples, even after the Shrine Guardians have been defeated. There is no limit to how many times a team can enter and defeat an island's main Temple. The goal of Temple Raid is to battle across five elemental islands, progress down each island path, and reach the Temple to defeat the powerful Guardians that lie in wait. Energy Resets will occur every 12 hours for this event. Dragons of the same element as the island will receive bonus points for attacking other players or Temple Guards. The dragons only have a battle advantage against the final Temple Guardians. Temple Guards will be the checkpoints for teams on the island path, and they must all be defeated in order to reach the Guardians of the Island Temples. 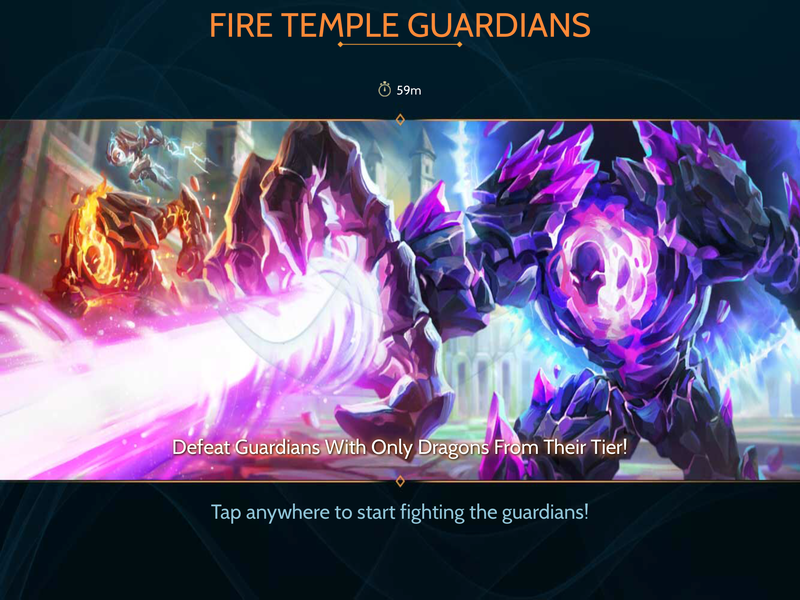 Your team can attack an elemental island multiple times and defeat the Temple Guardians each time for more Victory Points! The Storm will rotate around the elemental islands, moving every 3 hours. During the 3 hours it’s over an island, no teams can exist on that island. When a Storm leaves an island, that island will become Supercharged. Supercharged islands give bonus VP in the main Temple, but is only granted to the first team to make it to the Temple. The Shrine of the Elements is an optional boss rush encounter of the Temple Raid event, which unlocks after defeating the main Temples on each island. These bases will be much harder to defeat than the island Guardians. The Temple Raid event has a lot of moving parts, and a myriad of new terms to learn. Once teams have an understanding of the islands, Temples, and Guardians, it’s time to assemble the troops! The best strategy is that which comes with communication - take great effort to keep everyone on the team informed of the Team Plan (which Leaders and Officers can set for the event, just like in Kingdom Wars). Target teams ahead of yours on the island path to be the first team to reach the Temple, especially if that island is Supercharged from the Storm. Always keep a watchful eye on the Storm, where it currently resides, and when it plans to move. Lastly, think carefully about which Dragons are used on which islands when raiding the Temple. Dragons of the same element as the island will always have an advantage and grant extra Victory Points in battle! 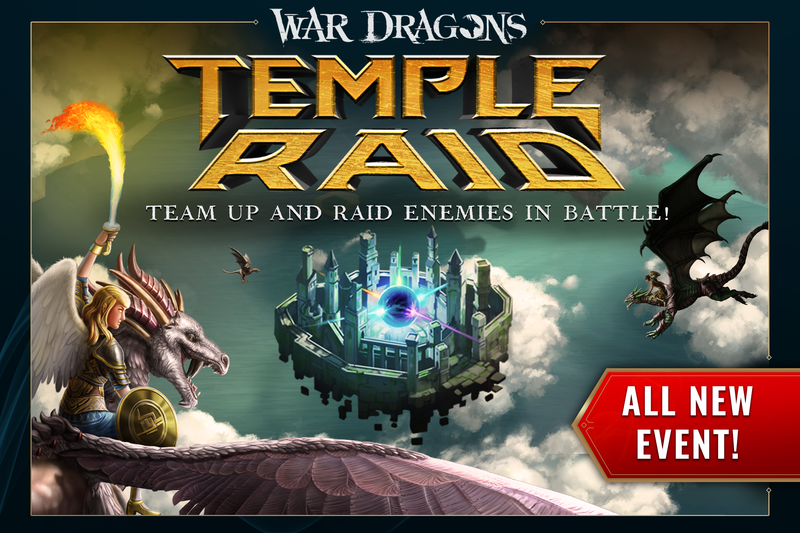 What are your thoughts on the new Temple Raid event? Tweet us at @WarDragonsGame and join the discussion with fellow Dragon Lords on the Official Dragons Forums!